For patterning of our thin films and nanostructures we run a clean room of class 100. The supporting infrastructure consists of a water purification system, a pure gases installation, a photo resist spinner, a wet bench, an UV-exposure system using Hg i-line, an inspection microscope, a photo resist ashing system, an ion etching system, a wire bonder. In order to achieve structure sizes below one micrometer we use an electron beam lithography or a focused ion beam lithography. The electron beam lithography uses the finely focussed electron beam for exposure of the resist material. The ion beam can directly remove material of the thin film using high energy Ga ions. The electron microscope also serves for material characterization with respect to the surface morphology and the film stoichiometry using energy dispersive x-ray analysis (EDX). 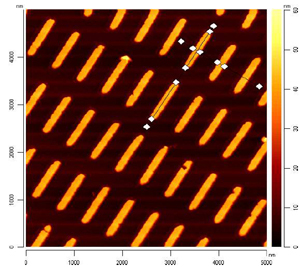 100 nm wide Permalloy stripes patterned by electron beam lithography. 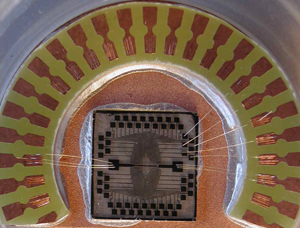 Patterned high temperature superconductor with bond connections to low temperature sample holder.